It’s not just the ladies who can feel that their stomach is too large, too loose or too wobbly. Growing numbers of men are also feeling unhappy with their middle and seeking ways to get a more perfect stomach. Abdominoplasty surgery for men, more commonly known as the male tummy tuck, is an operation to tighten loose abdominal skin to produce a flat tummy. There might also be excess loose skin following dramatic weight loss. This skin will have lost its elasticity and cannot be toned naturally. In general, tummy tuck surgery will be performed with the patient under general anaesthetic. The particular situation of each patient will determine whether they are admitted as an outpatient or inpatient in addition to how long the abdominoplasty surgery will take. This can be as little as one hour but can stretch to five. In general, the patient will remain in the clinic for one or two days. For several days following surgery, the patient is likely to experience some discomfort. Inflammation often occurs and the patient will be advised to use abdominal support for a certain period of time. In addition, painkillers may be prescribed, although pain is likely to be experienced only for few weeks. Strenuous activity should be avoided. The scars will fade in time, although not completely. As with any surgery, there is the small risk of complications with abdominoplasty surgery. At the time of your consultation, the expert we refer you to will take you through the risks in detail so that you can take an informed decision. They will not push you for surgery. They will give you all the time and guidance you need to take a decision. They will give you a comprehensive Abdominoplasty Patient Guide to take home with you. This will answer most of your queries and concerns. If you have any further questions, you can give them a call and they will provide their expert advice. You will love them for their honesty, integrity and professionalism. Complete abdominoplasty (full tummy tuck) – This is the most extensive tummy tuck available and is appropriate when there is a large amount of excess skin and fat across the whole abdomen. The surgeon makes a cut from right across, between the hip bones and will then contour the skin, muscle and tissue as required. Normally some degree of belly button reshaping is required. Partial abdominoplasty (mini tummy tuck) – This is a smaller tummy tuck, ideal for people whose excess skin and fat is below the belly button. An incision is made (as small as possible), normally at the knicker line (just above the pubic bone) and fat, skin and tissue contoured as required. Belly button reshaping is not normally required. Depending on the complexity of the procedure, the surgery can take between 1 and 4 hours. Yes, as all results are permanent, however if you can still gain weight in the areas in which you had the procedure, so we advise you to keep to a healthy weight and exercise regularly. Pregnancy can also affect the results of the procedure; we advise that you postpone the procedure if you are planning children. We recommend that people take up to two weeks off work following the procedure (more if your job is particularly physical). Strenuous activities, heavy lifting and intense exercise should be avoided for about 6 weeks after your surgery. Depending on the results you are trying to achieve, there may be various surgical and non surgical options available to you. You can discuss this fully at your free consultation. 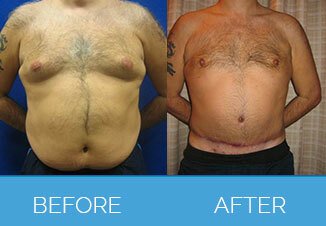 There are no patient stories for Male Tummy Tuck. Any form of cosmetic enhancement is very personal, so prices are bespoke dependent on your individual needs. As a rough guide, you can expect to pay £3500 – £7500.